I’ve been trying to get back into shape post baby so what better gadget feature to have on ITV Weekend than fitness gadgets. 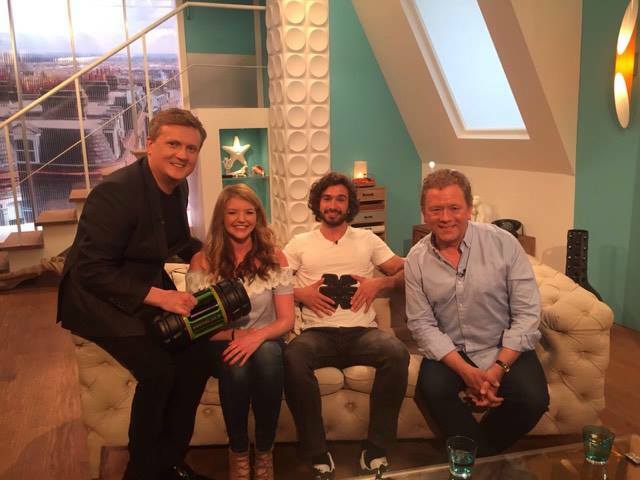 Joining Aled and me to test them out was Mr Super Fit himself – Joe Wicks, and the hilarious and charming impressionist Jon Culshaw. As usual on our gadget round-ups we had some weird and wonderful items. The one I was most excited by – and most sceptical about – was the SixPad. Now I want to get fit without lifting a finger as much as the next person so this was pretty intriguing. It uses electrodes that stick to your tummy and force your stomach muscles to contract whilst you get on with your day. The Body Coach slightly crushed my dreams when he told us this probably wasn’t going to be the miracle cure us lazy bones were after. Darn! One of our gadgets saw me weigh myself on telly – just what you need after a baby (ouch!). Thankfully the scales were so smart I didn’t mind too much. The Withings Body Cardio Scales dissect your weight into percentage body fat, water and muscle and also assess (and document on an App on your smartphone) your heart’s health. Bone conducting headphones were the order of the day too – with a swish pair from Aftershokz. Instead of the headphones resting inside your ear, these sit around the outside of your ear – sending the audio to your inner ear using mini vibrations through your facial bone structure. Kind of blows your mind right?! Great for leaving the middle ear open when you are cycling or running outside and need to hear the traffic and surroundings. Finally we had a piece of at-home gym equipment -the K-Fit Trainer. Joe was pretty impressed with this one I reckon. It is a 7-in-1 bit of kit that you can use as a dumbbell, a kettle-bell, an ab-roller, a foam-roller – the list goes on. You can buy various weights to increase how hard you work too. A nice small footprint size-wise if you don’t have the space (or dosh) for an at-home gym. Another wonderfully enjoyable show on ITV Weekend – already excited about next time.